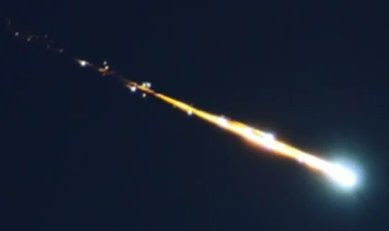 We have receive so many emails from people in the USA over the last 2 days about meteors and fireballs that we are overloaded. Please remember we are are the end of the annual Lyrid meteor shower. The video is showing a reflection of the sun in a cloud caused by ice cristals on that high altitude. Has nothing to do with fireballs! this isn't even a fireball.it is not moving!!! !....good catch.it looks more like a SECOND sun. Yes, it's a great shot of a mock sun (aka sun dog or parhelion). Not a fireball, meteor or ufo.